The Syracuse University’s PARCC – Program for the Advancement of Research on Collaboration and Conflict invites the community to attend this Labor Studies Symposium. 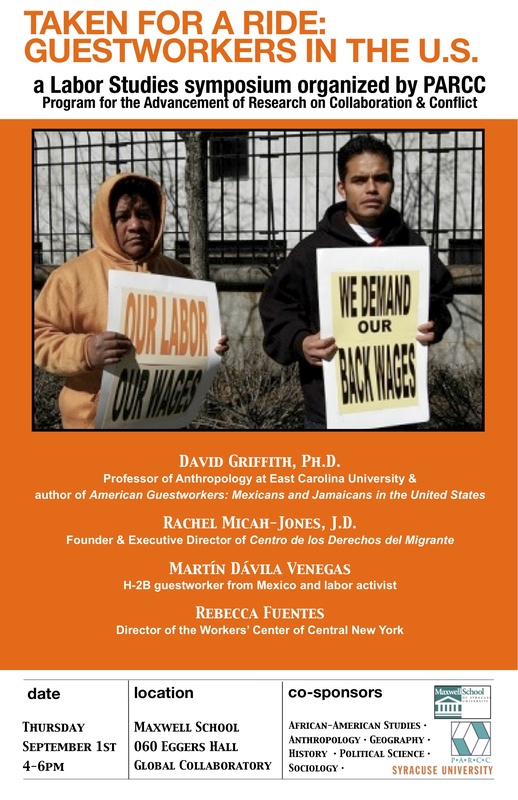 This event takes advantage of Syracuse’s distinction as host to the Great New York State Fair, an event during which, in 2010, the conditions faced by guestworkers were brought to light after a food contractor was found guilty of wage theft and human trafficking of at least nineteen Mexican guest workers. Participants in the symposium include our friend Rachel Micah-Jones, Founder and Director of Centro de los Derechos del Migrante and Rebecca Fuentes, Coordinator of the Workers’ Center. One of the organizers is the Workers’ Center Leadership Team member, Professor Gretchen Purser. This event will also be an opportunity to learn about ways to get involved in our ongoing campaign to support workers in the fair and carnival industry.